“Snowflakes from Vermont” features a collection of original wooden snowflake designs, crafted as ornaments and magnets, from 3/16″ maple hardwood using a laser engraver. Made in the USA. Original creations from the Northeast Kingdom of Vermont. 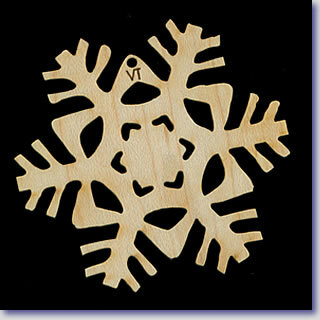 The snowflakes are created as 3″ diameter ornaments or magnets from American maplewood. The snowflakes are a wonderful gift idea for that someone who has everything, a memorable souvenir from that special vacation location, a wedding keepsake or token for wedding guests, a great fundraising item, a corporate loyalty gift or a special remembrance for your lodging guests. Four separate businesses from the Northeast Kingdom of Vermont are supported with the sale of each snowflake. The wooden snowflakes can be customized entirely to your specifications: engraved with the year, Vermont, a name, your logo, inspirational words, or left as a beautifully intricate snowflake design. 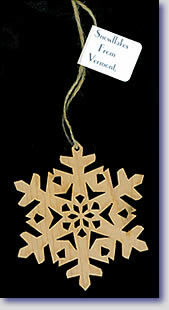 VT can be inscribed on each snowflake, and the attached tag identifies that the product is Made in Vermont. We encourage a more personal relationship with our customers to be sure that all details of your order are perfect. Please give us a call or email for your specific needs. The snowflakes are hung from jute twine or choose from our many colors of ribbons. We also have a series of metal snowflakes created from several of our favorite designs. These 26 gauge steel cut-away snowflakes come to us from a water jet artisan in Bisbee, Arizona, just miles from the Mexican border. Vermont is the home state of Wilson “Snowflake” Bentley who first photographed snowflakes at his home in Jericho, Vermont, in the late 1800’s. These Snowflakes will not melt!